OWINGS MILLS, Md. (AP) — Carrying a three-game losing streak and a losing record, the Baltimore Ravens now face the burden of uncertainty at the quarterback position. 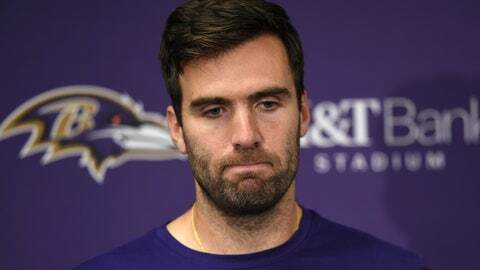 Joe Flacco is nursing a hip injury that could keep him out of Sunday’s game against Cincinnati, an AFC North matchup that carries huge ramifications for the sagging Ravens. With Baltimore coming off a bye, Flacco received an additional week of rest and treatment after sustaining the injury on Nov. 4 in the opening minutes of a 23-16 loss to Pittsburgh. Flacco went the distance, completed 23 of 37 passes for 206 yards. His status this week, however, is unclear. If Flacco can’t play, rookie Lamar Jackson will likely get his first NFL start, although veteran Robert Griffin III is also an option. Griffin gets the nod in NFL experience, but he’s been inactive in every game this season while Jackson has been used periodically because of his ability to run. The Ravens (4-5) reached their bye week with losses to New Orleans, Carolina and Pittsburgh. The skid ruined a decent start and left the team in recovery mode as it seeks to snap a run of three straight seasons without reaching the playoffs. This is the 11th season that Harbaugh and Flacco have been together in Baltimore, and the coach would love to see his quarterback rally the Ravens into the postseason. The 33-year-old Flacco has played through many an injury throughout his career. He did so against the Steelers. His teammates feel that if he can walk, he will play. Tackles Ronnie Stanley (ankle) and James Hurst (back) did not play against the Steelers, but both are expected to return Sunday when the Ravens begin a stretch — with or without Flacco — that will define their season.